The farm has become a community hub in Mount Healthy: It was formerly the roasting facility for Deeper Roots Coffee, and is currently an alpaca farm, an afterschool camp for neighborhood kids, and Mary’s family home. We talked in her living room over the sound of friendly dogs barking. Interview by Suzanne Wilder. Photography by Cassidy Brage. First, tell me about where we are. I always start talking about Tikkun Farm by talking about the name, because it’s essential to the place and what we do here. Tikkun is a Hebrew word, and it's part of the Hebrew phrase tikkun olam, which means repairing the world. 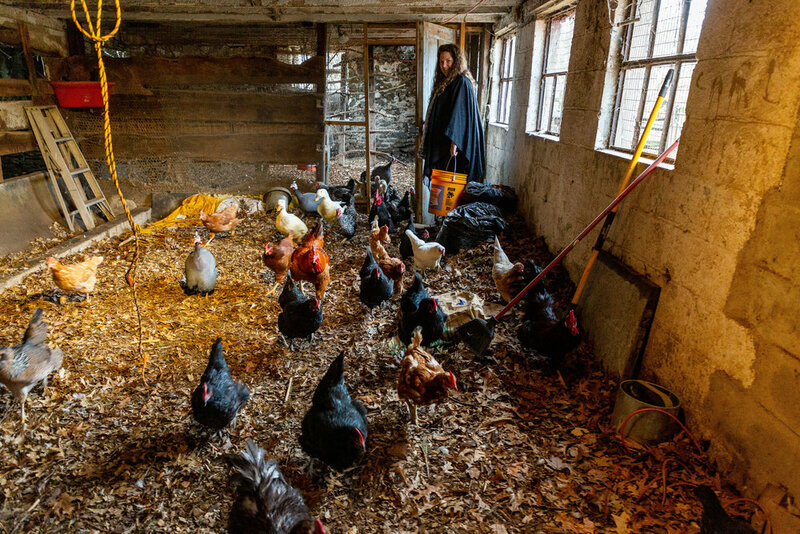 When we [Mary and her husband, Greg York] bought the farm in 2010, nothing was inhabitable. The place was an old dairy farm. It had been abandoned by the dairy farmers, probably 30 years earlier, maybe 40. And it had a couple owners since they left. Every building was broken, and nothing had electricity or power; roofs were leaking; pieces of the property had been gutted as the people who owned it were trying to start over and then didn’t. I was laying out in the field among the tall grass, and I was praying. I said, “God, our farm needs a name. What should we call it?” And the word I heard was tikkun. And God just said to me, “Repair the buildings, and I'll send people here whose lives need to be repaired.” I felt part of what God was saying was that these people will come here to be healed, and they will become healers. You know, it's always a flow. It's not, “I'm just going to receive something”; it’s that I'm going to receive something and then it's going to flow out into the world. And that's certainly been my story. My life has been a story that's been in deep need of repair and has been healed in so many ways over the years, and so now what I have received flows out of me. We emerged from that discernment time with a focus in three areas: heal people; repair community; restore creation. They felt to us, at the time, discrete. You know, we're going to heal people, we're going to work in community, and we're going to do something on our farm. And while we recognize that, of course, there was a common thread that ran through them. What I couldn't have known then is how centrally those pieces actually fit together and mutually inform each other. It turns out that when you take people who've had experiences of trauma and distrust and you put them outside on the land to restore it, the land restores them. When people begin to heal from trauma, and increase the capacity to be less reactive and less triggered and therefore less isolating or fighting, it repairs their community because their capacity to stay connected and be present in relationships exponentially increases. When we live in community and we create communities of respect and kindness and safety, it heals people. There was a study done a long time ago called ACES – Adverse Childhood Experiences Study. It identified seven things that, when they show up in your life, begin to change the long-term health outcomes for you. The more of the seven you have, the greater their impact on your long-term physical health; they change the outcome of the health of our bodies. It just became part of our mission to begin to help people become more aware about the Adverse Childhood Experiences Study and to integrate, in a really intentional way, the practices that can help the brain rewire itself. The thing that's beautiful is that the brain can rewire itself. That was our intention. The other thing that I've learned is that, just as God was sort of planting seeds, we've only been discovering how interconnected things are. That was before we had discovered our mission. We lived into it. A couple of years later, people at my church thought it would be great if I had a baby alpaca, so they gathered together to buy a baby alpaca. The alpaca farmer was trying to downsize, so she sent a momma along, and then she bred the mom, so we went from three to five… Now we have all these alpacas, and they’re cute. We shear them every spring. And we piled up their fiber in the barn, and I was like, “I don't know what to do with this.” But I couldn't find a good way to get rid of it. I asked for farmers, and there they were. At the same time, I got an email from a farmer who asked if we’d be willing to let Bhutanese refugees farm the land. That was how I met Sheryl [Rajbhandari, who works with refugees and immigrants via The Welcome Project]. She knew of a family that had just arrived. All of the community gardens in Cincinnati had been filled, and they were looking for new places for people to farm. They showed up – this family of brothers and sisters, aunts and uncles, little kids. That was one of those things that came: I asked for farmers, and there they were. They love the farm. For me, it's a joy to see them. In the summer they come every day. So that became part of repairing community. Probably the first person who comes to mind is Margee Iddings, a Presbyterian minister. When I first started my trauma work, she was running a retreat center near my church where I was serving. And it was while I was on retreat at her center that I became aware of some of my trauma story. And Margee just knew how to create a safe space. She was the person who kind of modeled for me about leading retreats and creating. The things that I offer now, I learned from Margee. And then I've met other women like Margee – other women pastors – who've inspired me. There's been these really beautiful women pastors and, when I was in seminary, really lovely women professors, who – through both the way they taught and the way they lived – inspired me to integrate the gospel into my life in a way that changed people's lives. It's that “heal to be healers” concept. What would you want somebody reading about Tikkun Farm to take away from this? First, I want people to know more about trauma. I want them to know how deeply trauma impacts so many lives, and it's sort of invisible. I want people to know the trauma is recoverable. There are things we can do that will heal us. We have some wonderful places in the city that offer trauma centers, but they are very clinical. One of the gifts that Tikkun Farm offers is, I think, a tremendous access to healing experiences that are not clinical, that are outside, that are body focused, that aren’t one-on-one talking to a professional, but are just learning how to be safe in the world. The other thing is, Tikkun Farm does its work mostly through volunteers. We always, always could use volunteers. What I say to people is, “You can volunteer and benefit what we're doing through what you are already enjoy.” If you love to cook, we teach cooking here three days a week now, and our kids love to learn how to make good food. They love to learn. They love to bake cookies, but come and teach us how to make a potato casserole; come and teach us how to make your favorite beef stew. We would love for you to do that. We want you to get to know our kids, though, so we ask volunteers to try to be able to come every week, if they can. Or, come and teach art. If you don't feel like you could do the art or the cooking thing, please sit down with one of our first graders and help them read. It's an incredible statistic that says a child who's not at reading level by third grade is more likely to go to jail. So with our youngest kids we don't do creative writing; we do reading, and we've learned that every kid needs their own adult. And so we need a lot of volunteers during our homework time from 5:30 to 6:30, Monday through Friday. We definitely would love to have more folks like that. What would you like to see next for Tikkun Farm? When Deeper Roots moved out last summer, we went about renovating [the old dairy barn]. So then we had a dedicated art room, and we had indoor gathering space so we could expand from 20 kids a week to 30 kids a week because we had two places to do yoga and activities. And so this year we spent a tremendous amount of time renovating that space. When we live in community and we create communities of respect and kindness and safety, it heals people. But my heart is in the humongous, big barn over here. We can't really save the barn, which has been heartbreaking to me. What we need to do is dismantle the barn, save the wood, and then rebuild in that spot. Part of the barn will be used to offer a Montessori preschool, and we imagine part of it will be a bigger, commercial-sized kitchen. We’d also like to put in a space that’s dedicated to woodworking. There's a lot of kids who don't want to go to college. And again, working with your hands is a very healing process. And we need more carpenters. Then on the second floor of the barn, we’d set up small offices to do one-on-one work that’s really essential for trauma recovery. You can get body massage; you can get Healing Touch; you can get acupuncture; you can do talk therapy. And then in the other half, we would create a big, open space so there could be a place much more conducive to yoga, to group retreats, to group therapy work, and stuff like that. So then we could begin to bring practitioners here to set up a more clinical experience, in addition to the outdoor/creative arts/nature experiences, because they go hand in hand. Pretty soon we're going to have to start a capital appeal to both dismantle the barn and then rebuild it. I was really keen on keeping the barn because the building itself is a metaphor for the work we want to do. When you walk in there and you look up at the roof, the beams of the roof, some of them are all charred, because the barn has survived a fire. Those charred beams are right next to other beams which are not burnt, and it's like a scar on the roof of the barn. And I wanted somebody who was laying on the yoga mat to look up at that ceiling and know that they were in a building that had survived its trauma and was now being used to heal trauma. That's the metaphor. We are healed to become healers.